The great folks over at Makeblock have created a nice little board for creating robots, the mCore. The board is intended to be used for teaching programming, robotics, internet of things, etc. As a learning tool, it is primarily used with the custom version of the Scratch programming environment called mBlock. There is also a library for regular Arduino IDE programming as well. What is lacking, however, is a good write up on the various pin assignments used for the on-board peripherals that Makeblock added. Thankfully, at least there is a schematic to help us out. Based on the schematic, here are the pin assignments. Additional detail on each peripheral is provided below the table. The Toshiba TB6612 is used as a dual channel motor controller. The inputs to the controller for each motor are a PWM pin for speed and two direction pins. The mCore designers simplified the interface such that a single Arduino digital pin controls direction (it is inverted in hardware to provide the second direction input to the motor controller) while a second PWM pin controls speed. The M1 connector on the board is controlled by D6 (PWM speed) and D7 (direction). When D7 is HIGH, the motor turns CW. When D7 is LOW the motor turns CCW. Likewise, the M2 connector is controlled by D5 (PWM speed) and D4 (direction). However, in this case the function of D4 is reversed. When D4 is HIGH the motor turns CCW, and when it is LOW it turns CW. Reversing the function of the two direction pins may seem odd, however, when you think about it, the motors are generally on the opposite sides of the robot so they need to turn opposite directions for the bot to move either forward or backward. Consequently you can use the same 'direction' setting (HIGH or LOW) on both outputs to get the bot to go in one direction, for example, forward. There are two WS2812 RGB LEDs on the board. These share a pin (digital pin 13) with the traditional LED seen on most Arduino boards. You can use any of the existing NeoPixel libraries to control these LEDs. In addition, the pin (D13) controls a blue LED on the board so the standard Arduino blink sketch will work correctly on the mCore. The speaker is connected to digital pin 8. 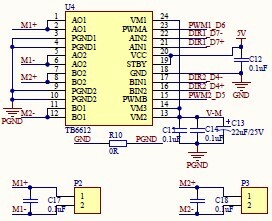 You can drive this pin using the standard Arduino tone() library call. The light sensor is a standard CdS photocell configured as a voltage divider. This is hooked to analog pin 5 so you can read the voltage (and hence the amount of light) using analogRead(). 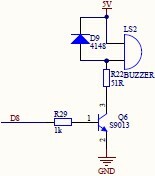 The IR LED is simply hooked to a digital output pin (digital pin 3). You can use this to transmit data or to detect objects in front of the bot (by bouncing light off of objects and reading it with the receiver). The IR receiver, on digital pin 2, is intended to be used with the included remote control. It can also be used in conjunction with the IR LED for communications between bots. The Makeblock library includes routines to read the button presses from the remote. This is just a basic pushbutton with a pull-up resistor hooked to analog pin 7. When the button is pressed, the value on A7 will be low. It can be used to start your program or pretty much any other function you program in. Unfortunately the designers wasted an analog input with just one button. They could have included more buttons on the same pin by simply creating a voltage divider network with each of the buttons having a different resistor (and thus a different voltage / value when reading A7). The bot comes with either a bluetooth or 2.4GHz radio. This is the connector for the radio. 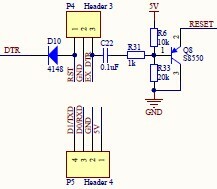 The design allows the radio to communicate using the standard Arduino Serial() calls. The four RJ25 connectors make it easy to connect a variety of peripherals to the mCore. The top of each connector has a color coded block to indicate the types of peripheral that can be attached. In turn, the peripherals themselves have color coded connectors. Hooking things up is as easy as matching the colors. Each connector has power (+5) and ground connections along with the I2C bus clock and data pins. The remaining two pins on each connector have either two digital or two analog port pins, depending on which connector it is. Port 1 has digital pins 11 (PWM) & 12. Port 2 has digital pins 9 & 10 (both PWM). Port 3 has analog pins 2 & 3. Port 4 has analog pins 0 and 1. Copyright James Brown, All Rights Reserved. Simple theme. Powered by Blogger.